Bulk carriers tend to get a bit of a raw deal. There is little glamour attached to them and they are often perceived to be the dirty old work-horses of the merchant fleet. They have a bit of a reputation, too, for being generally ill-cared for, rusty and prone to sinking. However, just as with general impressions of large groups of people such as politicians and students, ships’ reputations, too, are often based on a relatively small number of bad experiences, and this does not always lead to a fair assessment. For example, back in the 1980s and 90s, when corrosion was causing ships’ sides to fall out, many even within the industry were under the impression that it was mainly a bulk carrier problem. In fact, the more glamorous tankers were much worse in this respect. However, because bulk carriers were much more prone to rapid sinking as a result (and indeed did on a regular basis), they got more tarnished with the rusty reputation because of the loss of life that was involved. Tankers, as we all know, though, can break up and sink too, but it is true that they have tended to do so at a slower rate, giving the crew a better chance of getting off. Tankers have also been more prone to blowing up (and indeed some still do), and it is interesting to note from the total loss rates reported by IUMI (International Union of Marine Insurance) that tankers have regularly been worse than bulk carriers in terms of numbers of ships lost over the past few decades — see Figure 1 below. However, even though it could be argued that tankers are worse in terms of loss of property and environmental impact, there is no getting away from the fact that sinking bulkers have tended to kill of the order of three times as many crewmen per incident than tankers over the years2. Formulating and implementing effective worldwide regulation for enhanced safety is horrendously difficult. Trying to get a consensus, on the perception of risk, battling against the economic pressures against change, fighting the potential ‘lowest common denominator’ compromises to enhanced standards, and implementing grace periods in a fair but sensible way, are not tasks for the faint-hearted. Despite such difficulties, the last decade has seen very positive improvements in international regulations governing the safety of bulk carriers. One compartment damage stability is certainly better than none, as was required before, and the increased strength of bulkheads to withstand flooding of a hold without the bulkheads collapsing is clearly a good and consistent measure. Strengthened topside structures against green seas, hold and bilge water level detector/alarms, and enhanced bilge pumping systems clearly better defend against water ingress and accumulation. With regard to structural integrity, there is now a raft of measures aimed to keep the hulls in better shape than before: greater restrictions on cargo loading in holds to avoid overloads of the hull girder; improved methods of handling cargo to avoid localized damage (from bulldozers, grabs and jack hammers, etc. ); hull stress monitoring; modern strength and stability computers on vessels; plus enhanced programmes of inspections. So do they work? Dry Cargo International asked Braemar (Incorporating The Salvage Association), often referred to as Braemar SA, to address a few questions regarding the tangible benefits of all this. HAS THE INCREASE IN SCRAPPING AND NEWBUILDING MEANT THAT BULKERS ARE GETTING SAFER? With an increasing proportion of the bulker fleet that should now have been built to the full enhanced standards, we would have certainly expected that to be the case. Logically, the many individual ships that have been well built and are being well operated must be safer. However, short-sighted business trade- offs (as always) conspire to negate any such benefits. There is still significant concern within marine insurance and casualty surveying circles regarding new-build construction quality, particularly, but not exclusively, within Chinese tonnage. Horrors of structural misalignments, the filling-in of badly fitting plating with oversized welds, the often poor quality of cast components, and so on, can mean that vessels may have weak points and are significantly less able to withstand even the normally expected high sea conditions at times, let alone extreme conditions. The general trend of the total loss rates for bulk carriers shown in the graph on p25 clearly show an overall improvement, so the well-found vessels still have the upper hand; however, niggling questions remain as to whether the improvements should have been better than this and whether loss rates will start to increase significantly again. Before leaving this question you could ask are bulkers getting safer (in principle at least) in all respects, and the answer would probably have to be no. For example, the graph shows some peaks in the bulker losses during the period 2006 to 2012 superimposed on the declining trend and these are likely a reflection of the vessels lost from cargo liquefaction, an old lesson learned that had been forgotten again, perhaps, and still not well guarded against in the enhanced regulations for design. WHAT, IN YOUR OPINION, IS THE GREATEST REASON FOR BULKERS TO FAIL? 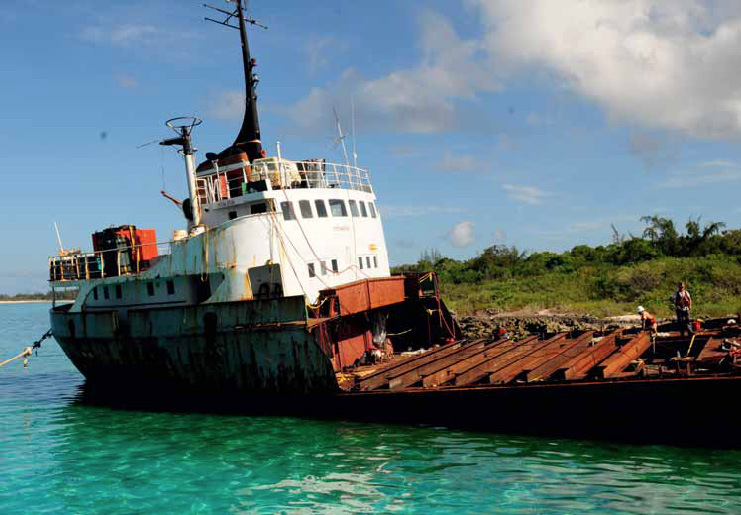 A total loss or structural failure occurring in the open sea without an obvious preceding event such as a grounding or collision, in our opinion, will usually be, primarily, as a result of poor construction, as above, or through-life structural deterioration due to corrosion, fatigue induced cracking, and/or accumulating hull deformations from rough cargo handling on loading or discharge that can reduce the buckling resistance of structural members. Sudden catastrophic structural failure of the hull is probably the less common immediate result: rather, partial failure leading to the ingress of water will usually be the starting point, and the consequential additional adverse loads on the hull can then lead to a more major structural failure or total loss. However, seldom will a total loss be due to just one factor. Usually there will be other influences at work such as high (though not necessarily extreme) sea conditions and/or, perhaps, incorrect loading of cargo that puts higher than expected ‘still- water’ loads on the hull. Weak and poorly secured hatch covers may also contribute to the loss of a vessel. It may surprise people but there is a right and wrong way to close and secure a hatch such that even a hatch in apparently good condition may not be weathertight when the crew have battened it down. Misconceptions and ignorance of some operational personnel on-board or on-shore undoubtedly plays a part as well, in some cases. For example, the terminal operators in a loading port might think bulk carriers look big and strong, and find it hard to imagine breaking them: but if they were to understand the principles and do the sums they would find that it is relatively easy to get a loading configuration on a large vessel that exceeds the maximum allowable bending moment. If the ship survives the loading in port and then goes to sea in that condition, there may be little reserve strength left for wave action before catastrophic collapse occurs. IS HUMAN ERROR A SIGNIFICANT FACTOR IN SHIPWRECKS? For bulkers ending up on the rocks, we would tend to agree that in most cases the proximate cause is still human error. Navigation or watch-keeping errors are often found to have played a significant role. Recently, with the rushed onset of ECDIS (Electronic Chart Display and Information System) we can see what were once ‘Radar Assisted Incidents’ being replaced by ‘ECDIS Assisted Incidents’. However, if you dig down to the root of the cause, you will often find that crews are younger and inexperienced, having been given far less supervised training than they should have had, considering the value of the vessel they are operating and the value of cargoes carried on board. We have witnessed a continuing decline of the standards of crew practical training and experience over the years. This is more to do with cost-cutting on the part of owners and operators — a symptom of the economic pressures of our times — a known factor that can hardly be described as human error. On top of this, the crew are often obligated to work long hours during cargo loading and subsequently, following the vessel’s departure on voyage, are required to immediately carry out navigation watchkeeping duties without sufficient rest periods despite regulations. Indeed, tiredness of the navigating officers is often the root cause of navigational incidents. DO LOSSES OCCUR OVER THE WHOLE AGE RANGE, OR DOES IT TEND TO BE MOSTLY OLDER VESSELS THAT ARE LOST? Casualty statistics of bulk carrier total losses over the last ten years show that losses occur over the whole age range, almost uniformly over the first 20 years, but with significantly increasing frequency for ships over twenty years old. The latter increase is likely to be a combination of the ships’ structures being worn out plus, perhaps, a lack of investment for reasons of “economy” if a vessel is perceived as being close to her end of life. The absence of a clear correlation with age within the normal expected life of these vessels is actually a bit disturbing as you would expect some level of structural degradation with age, and the total losses occurring within the first five years probably point to the new problems of construction quality mentioned earlier. DOES MORE STRINGENT REGULATION MEAN THAT FEWER CARRIERS ARE IN NEED OF SALVAGE? We have not found that to be the case. The new regulations are addressed more towards ship survivability rather than normal casualty avoidance. The vessels are just as prone to collisions and groundings and cargo liquefaction, for example, as they were before. Human error is a factor against which you cannot legislate. Perhaps they are even more prone to such events considering the introduction of new technology such as electronic charts with economic cut-backs in crew training as a result of the cost of the new safety measures in the ships. Our experience is that the incidence of serious incidents (short of total loss) is not significantly reducing. Part of the problem may be that more owners appear to be looking for loop-holes in the regulations. For example, it has been reported that some owners are converting container vessels to bulk/breakbulk carriers: but the worry here is that the original hull design was based around a relatively small GM (metacentric height) to keep the roll motion as small as possible. When a heavier ore type cargo is stowed in such a vessel the GM will be significantly increased subjecting a vessel to greater potential roll motion and increased stress for which the vessel was not originally designed. In other instances, it is reported that top- side ballast tanks that are no longer in good condition are declared to be void spaces. This reduces inspection requirements and significantly affects the vessels’ ballast capacity and safety on ballast passages3. WHAT LOSS-PREVENTION MEASURES DO YOU RECOMMEND? Routine testing and inspection of structure, hydro testing of ballast tanks and UT (Ultra Sonic) testing of hatch covers and deck vents for P+I interests are essential weapons in the fight to maintain standards. However, even here the use of cheaper, less qualified/inexperienced surveyors, and in some cases, surveyors lacking integrity, can negate the value of a survey. The loss prevention methods are the joint responsibility of class, owners and operators. The continual monitoring by class survey is vital but this is under the control of the owners. We believe, though, that this can be enhanced by the carrying out of ‘Joint Hull Committee’ condition surveys at the behest of underwriters to protect their interests. The enhanced survey programme onboard must be exercised by the crew with due diligence for such loss prevention assessments to be effective. Critical structural areas such as corrugated bulkheads in cargo holds are often the Achilles heel with respect to transverse bulkhead integrity following any ingress of water via the side shell plating where, in high seas, the frames may have tripped from the plating allowing flexure, continued frame welding fatigue, and leakage or eventual loss of the side shell section due to wave motions and variable forces imposed on the plating. Sloshing of flood water set up by the vessel’s pitching motion may then lead to a loss of watertightness of the transverse bulkhead, fatigue fracture, and tearing of the bulkhead at the top and /or bottom. Ballast holds are particularly susceptible to increased corrosion and require increased maintenance. Of course the ability of a crew to exercise due diligence is dependent upon the number of available crew on board. Similarly, ballasted holds, if not fully ballasted and ‘pressed up’ on voyage can experience abnormal loadings on the hatch lids, bulkheads and side shell plating due to ‘sloshing effects’. Cargo load plans and correct procedures for load rotation/deballasting rates and careful stress monitoring to be strictly adhered to. Accurate details of the cargo must be obtained from the shipper. The crew must have a thorough awareness of all hazards and correct certification, knowledge and use of the IMSBC code, IMDG code, SOLAS Cargo Manual — The 1997 ‘Blue Book’ (Cargo Packing) — thankfully soon to be replaced by a new version. Moisture limits, etc., of nickel ore/iron ore fines have caused significant recent concern for liquefaction. DRI (direct reduced iron) is another cargo with spontaneous heating when wet, to name but a few. Improved fire detection and fixed extinguishing systems for all cargo spaces. COULD YOU GIVE DETAILS OF YOUR MARINE CASUALTY INVESTIGATION SERVICE? WHO EMPLOYS YOU TO CARRY THESE OUT? We undertake casualty investigations on behalf of Hull and Machinery interests, P&I clubs, owners, the legal fraternity and Flag State interests. In the UK we do work for the MAIB (Marine Accident Investigation Board) and also with the DfT (Department for Transport). Braemar SA has a large resource of expertise including marine engineers, master mariners, naval architects, SCRs (Special Casualty Representatives), cargo specialists and pollution control experts. These experts cover the marine consultancy and surveying spectrum and are strategically located around the world to ensure minimum response time combined with local knowledge. DO YOU CARRY OUT A LOT OF PREVENTATIVE WORK, ADVISING OPERATORS HOW TO MINIMIZE THEIR RISKS? WHAT FORM DOES THIS WORK TAKE? Braemar SA carries out loss prevention condition surveys for P&I insurers, typically at the Members’ pre-entry to the P&I Club, in addition to their requirements for annual or interim condition surveys. Within the hull and machinery market, we carry out JH 2013 / 007A, B, C and D type condition surveys in order to technically assess the insurers’ risk of underwriting such tonnage. The 7A, 7B, 7C and 7D surveys relate to engine room machinery and bunker fuel risks, condition survey, crew and office management assessment audit (to ensure owners are fully compliant with the ISM Code), and a full structural condition survey, respectively. WHO ARE YOUR MAJOR CUSTOMERS? DOES THIS CUSTOMER BASE REMAIN FAIRLY STABLE, OR DOES IT CHANGE SIGNIFICANTLY FROM YEAR TO YEAR? HAS THE ECONOMIC DOWNTURN HAD AN EFFECT ON OWNERS/OPERATORS IN TERMS OF ‘CUTTING CORNERS’? IF SO, HAS THIS RESULTED IN SIGNIFICANTLY INCREASED NUMBERS OF CASUALTIES? We do not have sufficient data to give an answer to this.What we can say is that we notice in some cases a reduction in general cosmetic maintenance which can, over time, cause issues due to corrosion and maintenance periods of peripheral but essential equipment being extended which can increase risk to the equipment and/or the vessel itself. In addition now, due to fewer crew and/or a lack of crew ability, maintenance is often reliant upon shore assistance. This again is often left until a cheap option in say, the Far East, becomes available. Braemar SA operates out of 26 locations spread across the world, giving the company a genuine global coverage. Braemar SA sits within the technical division of Braemar Shipping Services Plc and has access to the significant expertise within its sister companies who also have multiple locations worldwide. WHAT PROPORTION OF YOUR WORK RELATES TO BULK VESSELS? DOES THIS PROPORTION FLUCTUATE? This is a variable figure as such work is often fluctuating due to casualties occurring in adverse weather conditions for example. It would be reasonable to say that within Braemar SA we have bulk carrier surveys and issues being responded to regularly, but not significantly different in terms of a pro rata frequency from casualties involving other types of vessel. Braemar SA will continue to provide expert services worldwide to its clients with emphasis on loss prevention and will expand its global survey network coverage to meet our clients’ service requirements. We are dedicated to the provision of high quality, independent surveying, consultancy, and risk assessment services to the marine industry with the same objectives as class, shipowners and operators with regard to putting more focus on vessel condition and reliability. Our services are there to help to ensure that the vessel operators maintain and comply with statutory and Flag State regulations and the ISM Code, including with regard to the safety of the crew safe cargo loading and secure stowage. Early, intermediate intervention can help prevent costly, life-threatening incidents and vessel loss. 3. See ‘In Service Container Carriers Converted to General Cargo Vessels Classed to Carry High Density Break Bulk Cargoes Structural and Operational Risks’. P.D. Contratos and D.Whittaker, SNAME, 2012.